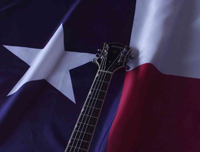 LoneStar Sound is your one-stop entertainment provider. Our experienced DJs will bring life to your event with their outgoing personalities. We have a top-of-the-line Bose sound system and an extensive library to cover every taste in music. Want to get your guests involved - try karaoke! We can provide that too. LoneStar Sound can provide party casinos - craps, roulette, blackjack, Texas Hold'em, poker. Name your game and we can oblige. Our main performer, Jessie Frank, is a talented guitar player and singer who has been entertaining audiences for over 35 years. He has performed with Bobbie Austin and The Cascades, Johnny Cash, Roy Clark and Winn Stewart. He has also toured with Willie Nelson and Glenn Campbell. Jessie worked for RCA records for 12 years and has appeared in numerous television commercials and a number of episodes of the TV series "Dallas." At the age of six Jessie met Gene Autry at the train station in Amarillo, Texas. That was the beginning of his love affair with the guitar. Using a second-hand guitar that his Daddy bought at a local pawn shop, Jessie taught himself to play. Later Chet Atkins would help Jessie develop his distinctive styling that is a melding of jazz and country. There were only two things that the young Jessie wanted to do in life: play the guitar and be a soldier. As a third generation soldier, he comes from a long line of self professed flag-wavers. When, during his third tour with U.S. Army Special Forces in Vietnam, he was sent home on a stretcher he had to accept that his days of being a soldier were over. He was awarded two purple hearts, the Silver Star, the Bronze Star and a Distinguished Service Cross. He looks back on his service to his country with no regrets and entertaining veterans is an important part of Jessie's music career. Today, Jessie entertains audiences with his acoustic electric guitar and a blend of old west, country, big band, gospel and swing from the 1830's through the 1950's and, of course, the music of the singing cowboys. "Some of my heroes were the singing cowboys, " says Jessie. "The music is so pure and uncommercial. Almost every song tells a story of some sort, and fits any age group." Jessie's warmth and humor blend with his natural story-telling ability to transform the music into a unique and personalized entertainment experience whether it is a one-hour performance or an entire evening. With his many years of experience, Jessie is adept at tailoring his program to a specific audience's interests. He also focuses on audience interaction so that everyone feels they have received something very special and personal.